David Klein might be the best kept secret in the world. Especially in the confectionary world. Klein is the creator and founder of Jelly Belly — but you may have never heard his name before today. The tiny, still ever-popular jelly bean is no longer associated with Klein — although he was the brains behind the creation and its initial success, he was only associated with the confection for four years. Jelly Belly was founded in 1976 — during the United States Bicentennial. With a little persuasion and even more limited funds from Klein, the petite confection was born. While jelly beans were not new to the market, Klein's idea — the process, flavors and ingredients — were unlike any other. Jelly Belly jelly beans were high quality — they had both flavored centers and outside shells (at the time, the inside of jelly beans did not have flavor), did not utilize gelatin, and came in unique flavors that had yet to be seen. Initially, sales were slow, but a pitch to the Associated Press would help launch the product into the stratosphere. During his reign, Klein would go on to appear on several talk shows and even pose for People Magazine — and subsequently became renowned as the "Candyman." However, only four shorts years later (1980), Klein, as the saying somewhat goes, "sold Jelly Belly for a song," to Herman Goelitz Candy Co. — the company that produced the confection — in exchange for $4 million split between he and his partner of over 20 years and a 20-year non-compete agreement. They took the Jelly Belly name and the continued profits. Today, their annual sales are close to $200 million. One Sunday morning I found an email from the Candyman himself. He introduced himself and naturally, I was immediately intrigued. He mentioned his documentary on Amazon Prime, aptly titled Candyman, and in a matter of a few hours I had watched the film — and was talking to him on the phone. As for how I was contacted? Credit goes solely to Kris Wheaton, founder of Quickstarter (QS), a free service for entrepreneurs to help design and launch successful crowdfunding campaigns — a program which I now run. QS is listed as a recognized "expert" on the Kickstarter website — and Klein came across it in his research. As soon as Klein answers, he tells me, "I have a new product. It's called Polar Popcorn. " Polar Popcorn? Why that name I ask? "We call it the freeze-and-eat treat. It is a caramel-draped puffy popcorn kernel wrapped in ice cream cake-flavored candy and coated with bright candy sprinkles. It is shelf-stable, but when placed in the freezer for 20 minutes, it takes on an entirely new taste." Of course, half joking, I immediately asked for samples. He is quick to accommodate — which I learn is one of his great traits. Prior to our discussion, I watched the documentary. His story is important for entrepreneurs everywhere. It is intriguing, important and replete with life lessons (who knew the candy business could be so ruthless?). Viewers will surely find Klein kind, whimsical, and generous — probably to a fault. He is also unique in every facet. Even today, one of his signature accessories is still a 9-pound rhinestone hat created by a designer in North Hollywood. The same designer that outfitted Elvis Presley. But creators are the authors of change — I learn quickly Klein is definitely one of them. "In the years post Jelly Belly, I stayed in California, working on different ventures." He tells me he was the first to create sour candy and a forerunner of the yogurt-toppings industry. "In 1998, my daughter Roxy developed 'Sandy Candy' which boasted 88 flavors of edible sand art." The business still operates today, though they have since moved to Florida. "In 2016, my wife Rebecca and I, along with my friend Stephanie and her daughter Ashley, made the trek to Florida and initially opened a new candy store there." It would close only a year later. "We were open seven days a week and initially chose the area because we thought there would be a lot of traffic. Turned out, there was too much — it took up to 20 minutes for people to get in and out of the parking lot." He is still looking for the next big thing — which he hopes to be Polar Popcorn. "We initially thought of the idea before we opened our store. We wanted to do something different — and I had initially started my career selling popcorn." Klein put himself through UCLA law school selling popcorn on campus and then would go on to invent candy instead. They went through variations and have had others test it. "It always gets rave reviews." On February 12, 2019, Klein will launch a Kickstarter campaign with the help of students from Erie universities and colleges — he is hoping to raise $8,000. He already has a manufacturer lined up and has been in discussions with potential distributors. I learn most of his experiences have unique backstories — even how he found his manufacturer. "When I travel, I prefer to take secondary or side streets because you never know what you might miss on the roads less traveled." On his way to meet a distributor, he passed a large ice cream factory in the middle of nowhere. "It was family-run and they agreed to meet. The next day I brought a sample and they loved it." And he doesn't want to stop there. "We already have a second flavor developed — which could potentially be part of a reward tier during the campaign," he hints. As for advice for aspiring entrepreneurs? "Try to make the most out of every single day so that at the end of the day you can actually write down what you did to get your idea off the ground or benefit your business. Keep a business diary. Look at everyday products and ask yourself how you could improve on that product. Look to combine things that nobody in their right mind would combine. You never know what you're going to come up with!" I hung up believing he is still destined to be in the candy business. Want to know more? Stay tuned for the launch on Facebook at @PolarPopcorn. 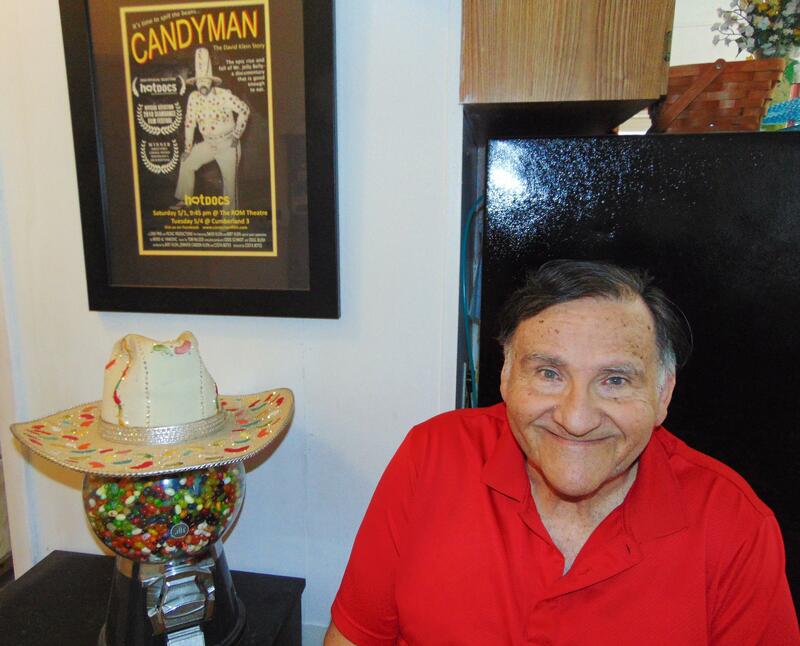 Candyman: The David Klein Story is available on YouTube and Amazon Prime.